Hotmail – Microsoft Account is sign on web service that is a combination of an email address and a password that you will need to be able to use Microsoft devices and services. It can help you access Skype, Outlook, Windows phone and other Microsoft services in whatever device as long as there is an internet connection. If you have decided that you want to completely delete your Microsoft account because of whatever reason you may have, then you can actually do so. Remember that deleting your Hotmail account completely will be a little bit tricky but you will actually easily get there as long as you will follow the steps correctly. 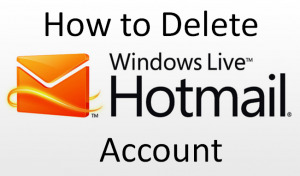 Provided below, are the steps on how you can successfully delete Hotmail – Outlook account completely. Always take note that once you will delete your account, you will lose all services and content associated with your Microsoft account. First, you must remove all personal information from your account. Take note that removing your personal information will close the account and once it is closed, you cannot reopen it anymore. To be able to remove your personal information, you have to remove all your friends first by signing in to Xbox Social page, locate and click the friend that you want to remove, then you click remove and then click yes, repeat the same process to all of your other friends. Next, you have to clear your profile information by signing in to Edit profile page, clear the name, location, motto and other bio fields in your profile and then click save. Then, you will have to remove your payment options. Just sign in Hotmail account, click payment and billing, then click payment options, click on your payment option and then click remove. After that, you need to go to Microsoft Profile center and set up your preferred contact information. Then, you also have to move your Xbox Live account to a new Microsoft account. After you have done removing all your personal information in step 1-4, you can now proceed in deleting your Microsoft account permanently. You need to make sure that there are no unsettled subscriptions or payments on the account. You need to sign in to Microsoft account. You have to click on Security – Privacy. Click on More security settings under account security. Navigate to the bottom part of the page and click on Close my account and click on Next. Read and review everything that you see on the page and after that, you can now check all the boxes on the page. You can select a reason why you are closing your account on the drop-down menu and then after that, click on Mark account for closure. Now, you have successfully closed and deleted your Microsoft account permanently. If you are having problems with the closure, the try to review the steps once again and maybe you have missed something.